‘I want to work away from the office – but not from home’. A phrase I’ve heard many times over my two years as Commuter Hub lead for MoJ National. Staff want to enjoy the benefits of working remotely but, for a number of reasons, working from home simply isn’t an option. It might be a lack of suitable space, or a lack of childcare cover (I can testify my children have played many a starring role in telephone conference calls!). In some cases, it may be the need to create a clear line between home and work, or even the social aspects and networking opportunities offered by an office environment. Whatever the reason, MoJ National is committed to providing more choice and flexibility over where people work. I am very proud to say we now have over 45 hubs situated from Brighton to York. The popularity of our hubs are increasing; with more than 3,000 staff enjoying the benefits of flexible working from hubs each month – highlighting the appetite for smarter working across our department. To keep up with the ever-growing demand, we’ve been working with partners and other government departments to expand the number of commuter hubs we can offer. We recently set up 8 new hub sites across the country with our colleagues in Her Majesty’s Courts and Tribunals Service (HMCTS). “Some months ago, I worked with the commuter hub team to source available HMCTS hub space in the regions. These hubs are invaluable in striking a work/life balance for our people. Modern technology means it makes sense to work from a local base from time to time, providing it fits in with your business needs. We’ve also joined forces with the Libraries Taskforce. Libraries give us a unique chance to launch even more high-tech hubs in the heart of communities, cutting journey times by up to 90% and allowing staff to walk and/or cycle to work. 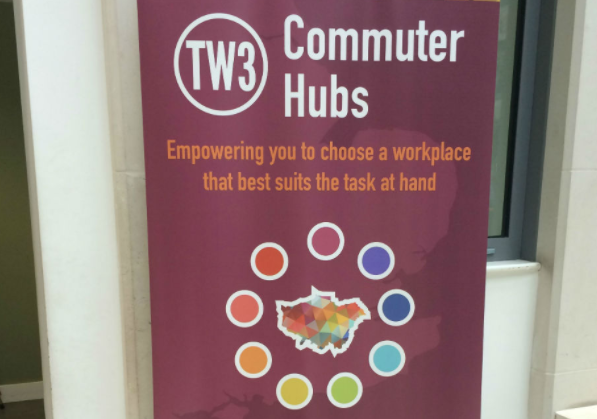 The first phase of the library commuter hub pilot included a number of libraries across London and was a success with overwhelmingly positive feedback. A recent survey showed that staff enjoyed a reduction in commuting costs, improved work/life balance and reclaimed precious time to spend with family and friends. Talk about a win/win/win! Following the success of phase 1, we have recently opened 5 further sites situated in libraries in Leyton, Putney, Basingstoke, Farnborough and Witham. This collaboration has benefited not only MoJ staff but also libraries in giving them an extra income stream from otherwise redundant (back office) space. For me, the hub programme is a vital part of MoJ National in that it truly improves flexibility and wellbeing for all of us – empowering us to decide how and where we work and reclaim that all important commuting time. We’ve recently launched a Smarter Working campaign and we’ll continue to promote the variety of flexible working options available. Smarter working will foster a culture that encourages creativity, efficiency and collaboration.